The tranquil setting of Collins Park provides the perfect family escape. 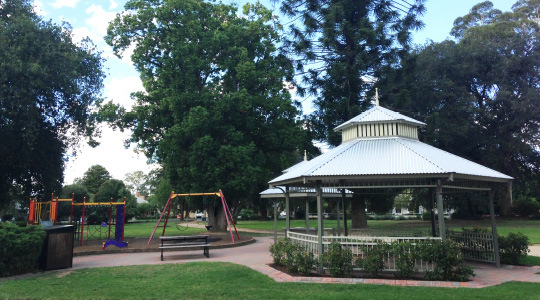 Located in the centre of the park is a playground for the kids with mature trees providing plenty of shady spots. Cast in 1795 by F.S Kinsman of England originally a Warships gun. At some date unknown this gun was offloaded and fitted with wheels used in 1851 to quell the gold riots at landing flats. Towards the end of the 19th Century, it was brought to Wagga Wagga to mark the noon day as at that time Wagga Wagga had no town clock. In later years only fired on Empire Day (24th May). Originally located at the race course it was later moved to it's present location. A playground is situated in the centre of the park. Conveniently located around the playground is a gazebo, a double bbq and picnic benches with the large trees providing shade for most of the day. The trees are really the highlight of the park, with varieties such as Bunya Pines and Plane trees. Most of the trees are over 100 years old.